We had a very large group; 3 tables worth! Unfortunately, we could only get 2 of the tables near each other, but we worked it out to have everyone together. It's a beautiful venue, large windows, high ceilings and comfy booths. 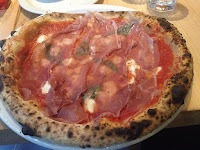 As a bonus, they were have featured pizzas that goes towards the MealShare program. Added bonus: this place has pizzas certified authentic by Italy. Let's do this! my entrée. 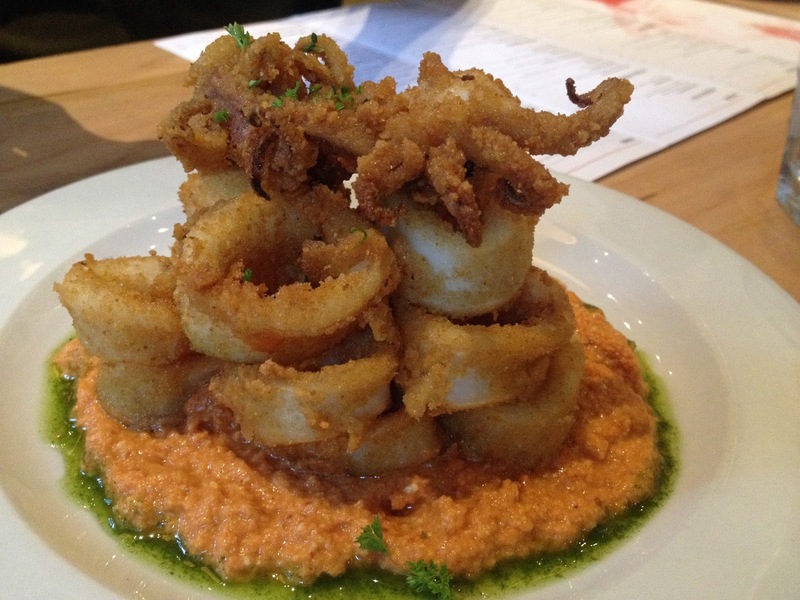 The calamari was pretty good! Not chewy and the batter was crispy and little addicting. It came with a red pepper almond sauce that was to die for. I wanted to dip everything in it. The pizza was exactly as advertised; super thin pizza with a fluffy crust and fresh toppings. It is not the pizza you have delivered to your house, so don't expect it. The sauce is crushed tomatoes, not tomato sauce. It's more acidic and tomato-y than I expected; the flavours are strong. There was a generous amount of mozzarella spread over the entire pie. The prosciutto sliced so thin, you could see through it. It was delicious, just like my uncle makes! This is definitely a pizza I could get used to. Considering it was a Friday night, the service was phenomenal; the place was packed! Our drinks were refilled, plates taken away and tummies full. They even gave us separate bills with no hassle. I now see what all the hype is about.